Hale Pali Moana 'Home on the Ocean Bluff' is an extremely rare vacation rental in that is a penthouse condo which uniquely offers 15 foot ceilings and private lanais unlike the lower floors and it the only Bali Hai facing penthouse condo that has a glass enclosure over the entrance lanai providing 400 more square feet of comfortable ocean-viewing space. Fully-furnished luxurious condominium with two bedrooms and two bathrooms. Sleeps up to six people comfortably with one king-size bed, one queen-size bed, and one queen-size sleeper sofa. 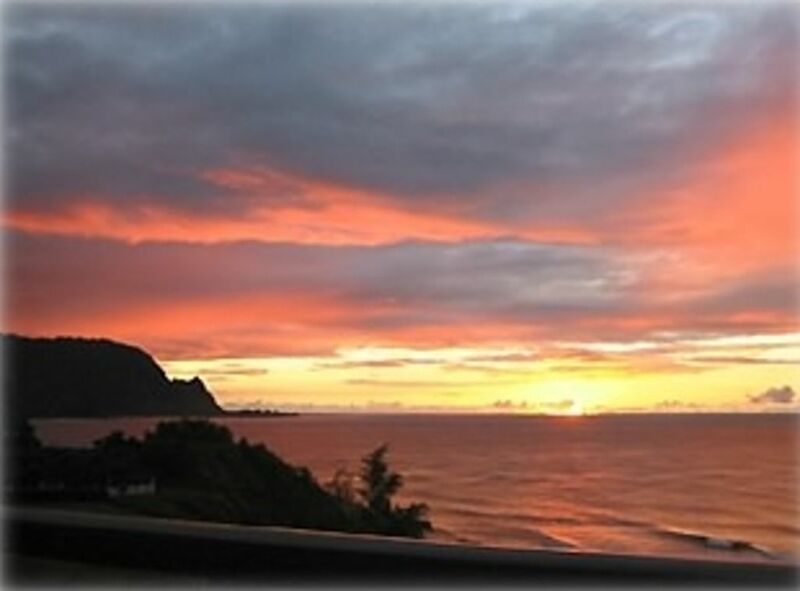 * Oceanfront, penthouse condo with 15-foot ceilings in world-famous Princeville on a bluff directly overlooking spectacular views of the Pacific Ocean and unequalled views of the famous sunsets on Bali Hai. *Completed a full renovation with top-of-the-line materials including granite countertops, maple cabinets, tiled floors, stainless steel appliances and a glass-enclosed lanai. * Recent refurbishment updated entertainment center in living room to IPOD accessible surround-sound audio/video system that also includes DVD Blu-Ray and CD, Netflix and Pandora capability. TVs in both bedrooms and flat screens in living and master bedroom. * Most recent Refurbishment also included new modern refrigerator, bbq grill, interior doors, fresh paint, deep clean throughout. * 2000 square feet of living space with two bedrooms, two bathrooms, kitchen, dining room, living room, one glass-enclosed lanai, and one open lanai. * Custom-made imported teak furniture and decorations from Thailand gives the condominium a feel of elegance in southeast Asia. * Spectacular views of the Pacific Ocean, Makana Mountain, and world-famous Bali Hai. * Watch spinner dolphins and breaching whales just yards off-shore. * World-famous golf at Princeville's Prince and Makai courses. * Tennis court and swimming pool on premise and access to the six courts at the Princeville Tennis Club. Tennis rackets available at condo. * Walk to Hideaways Beach just below Pu'u Po'a or drive to any of the world-famous nearby secluded beaches (consistently voted as the best beaches in the USA) along the Hanalei shoreline. * Walk 100 yards to the five-star St. Regis Princeville Resort for dining or shopping. For the most memorable visit to Kauai, make your stay in an oceanfront penthouse condo at Pu'u Po'a. At this penthouse condominium, you have dramatic views of the vast Pacific Ocean and views of the Makana Mountains that drop into the Pacific. From both oceanfront lanais, you have a dramatic view of Kauai's most famous peak - Bali Hai! Watch migrating whales, dolphins, surfers, and brilliant night skies from the patios. At night, view the brilliant star-filled night skies and listen to the sounds of surf. This condominium has been newly renovated to include top-of-the line, fully-outfitted kitchen with stainless-steel appliances and maple cabinets. The condominium has been tiled throughout and has been furnished with custom-designed furniture from Southeast Asia. The master bedroom includes a large closet, a king-size bed, bedside tables, and other beautiful, custom-made, Thai furniture to enhance relaxation while reading, listening to music or the surf, watching TV, or watching the whales. The master bath includes a large walk-in shower with dual shower heads and a Japanese soaking tub. Pu'u Po'a is situated on a bluff above Hideaways Beach, a great beach for snorkeling, surfing, and sunbathing. Pu'u Po'a has its own private swimming pool and tennis court. We are only one-half mile from the Princeville Tennis Center and the world-renowned 27-hole Makai Golf Course. The Princeville Tennis Center has six courts with available professionals for teaching and playing, and many players for pick-up games for singles and doubles. One mile further away is the Prince Golf Course, which is rated # 1 in Hawaii. Right across the street from the Prince Course is the Princeville Airport where you can take a helicopter tour of the island and see the magnificence of the Napali Coast where thousand-foot peaks rise out of the Pacific Ocean. If you prefer to sightsee on foot, the Kalalau Trail is for you. Whether you are looking for day, or longer, hikes to waterfalls and streams or to secluded, deserted beaches like Hanakapiai- this has it all! There are a number of other things to do and see including visiting the quaint town of Hanalei for local shopping or dining; or visit any of the well-known beaches including Ke'e, Pinetrees, Tunnels, Lumahai, and others. You can surf, snorkel, dive, kayak, hike, or horseback ride all within the area. If you are looking for a premier oceanfront residence for your trip to Paradise - this is it! Hale Pali Moana 'Home on the Ocean Bluff' is an extremely rare vacation rental in that is a penthouse condo which uniquely offers 15 foot ceilings and private lanais unlike the lower floors and it is the only Bali Hai facing penthouse condo that has a glass enclosure over the entrance lanai providing 400 more square feet of comfortable ocean-viewing space. Puu Poa Luxurios Oceanfront Penthouse...run the other way. This place is in atrocious condition. Pictures online look pretty good...just not the condition it is in. The property manager, Kauai Pacific Real Estate, is doing a terrible job. The maintenance and cleanliness of the condo was deplorable. Drapes are falling off the curtain rods and there are no pull cords (looks like a cheap motel). The living room and dining room lights were all burned out or non- functional. (This meant that we could only use 1/2 of the condo after dark.) There were no instructions about how to operate any of the lighting or the TV. The tile floors were so dirty that your feet turned black after walking around for about 5 minutes. (Yes, we leave our shoes at the door.) The rug on the living room floor was worn out, threadbare and filthy, unacceptable in a luxurious rental. We arrived late Friday and called KPRE first thing Monday morning. They said their maintenance contractor would call us. We were expected to make an appointment and work with the contractor to get things straightened out on our own time. We were paying dearly to help them fix things that were broken. Worse, the contractor's guy showed up with no tools or ladders or anything, looked at all the things that were broken and just left. He brought back a single floor lamp later that day...which promptly burned out. Nothing ever got repaired. Kauai Pacific had the temerity to send me an email saying they just took over the property and they had not heard anything from any renters. Obviously, according to KPRE, all these things magically happened after the last rental and before our rental. The views may be luxurious, but the upkeep and overall condition of the condo were very very poor. Puu Poa is our favorite property in all of Hawaii, but not this unit. I am sure the owner would be very displeased at how their unit is being managed if they only knew. The location is great, lots of extras included with unit, and everything was great. We enjoyed a wonderful family vacation. The condo was comfortable, had a great kitchen, and the view was incredible! My husband, daughter, son-in-law and I were here for my son's wedding at the St Regis and couldn't have asked for a better place to stay. It enhanced a special week by being totally stocked with everything you might need and was just a few steps from the St Regis. It was spacious, comfortable and quiet and the view is phenomenal. I can't recommend this condo highly enough. We had a great stay. The condo was just as advertised and was very well appointed. We loved the lanai (coffee in the morning, sunsets and grilling at night) and being able to walk to the beach. Definitely warm in the afternoons/early evening, but the ceiling fans and tower fan worked great and were much appreciated. Check in/out was a breeze. Definitely recommend! Like home away from home only in paradise. Well equipped with everything we needed. Comfortable furniture and beds. Can not have a better location in Kauai North Shore or in Puu Poa. Everything was fantastic and we can't wait to visit this unit and island once again. Thanks so much for an amazing stay. The security deposit of $500 can be waived if insurance is purchased for $49.